This story is featured in the May 2018 issue of Traverse, Northern Michigan’s Magazine. Get your copy! My father has secured us an orchard. It’s an old orchard, a retired orchard, its apples gone now to deer and wasps. Grass grows knee high between the gnarled trees, their boughs weeping at the ground. It is just the kind of orchard we want. “You wait here,” he orders, pointing at me. Then, he climbs the back steps of a farmhouse, bangs on the door as he opens it and lets himself in, hollering as he goes. I wait two ticks, maybe three, then ignore his command and follow. By the time I arrive he’s in the living room, talking to an elderly man with the knotted fingers of a retired farmer, and a mind that’s needle sharp. I can barely suppress my excitement as we thank Marce. It is spring in Northern Michigan—morel season. Nearly four decades have eclipsed since my father and I last foraged together. In the time since any spots either of us once knew have been paved or forgotten, stopped producing or been sold away. I moved to the West Coast, found my own habitats among the ashen remains of burnt pine forests, where morels grow in such abundance that it is not uncommon to pull 10 or 13 pounds in a day. There, you come home crisscrossed in charcoal stripes and laden with mushrooms, some so big they could be stuffed and roasted. Gilding the lily that was. Raised on Northern Michigan morels, and come of age on morels and chanterelles and matsutake on the West Coast, I’ve become an avid forager. Mushrooms—morels especially—are my weakness. So, when I moved back east I did so with the promise that I’d find a way to continue hunting no matter where I lived. Michigan, in spring, becomes my annual pilgrimage now, and in the process, my father has become my hunting partner. Outside the farmhouse we gather knives and bags from the truck, then we wade into the orchard together. The deer have been here before us, cutting trails through the grass. For the last few days we’ve been rolling through the county, he at the wheel, me gazing longingly at windbreaks of “popples”—say it the way my father does, popls—along the road’s edge. We’ve been to the banks of Cold Creek, to the hunting sites of my childhood, and we’ve come home empty-handed time and again. Landscapes change, our memories fade. Those places we were sure we’d find them, or where one or the other of us found them decades past, have not been producing. 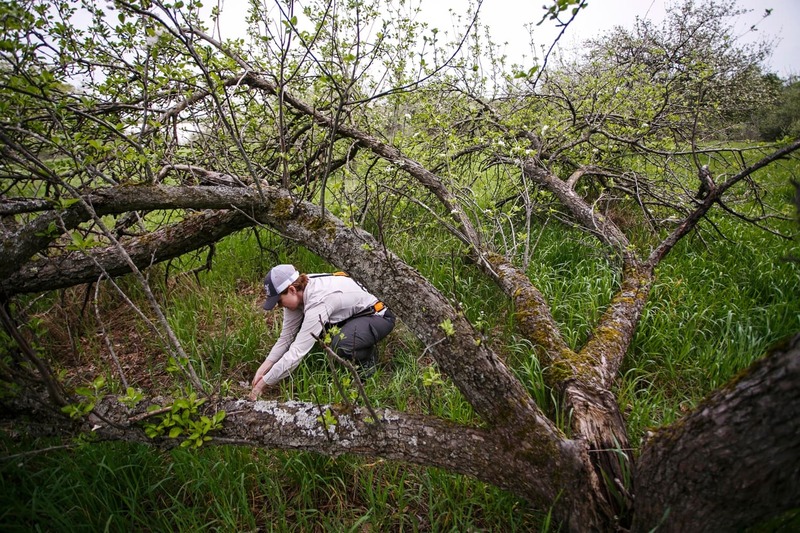 So, securing us an orchard, one of those sacred sites for foragers, means something. I’m thinking proudly of him doing this for me, and nervously wondering if we’ll come up empty-handed anyhow, as I duck under the crowned boughs of an old apple tree. Sunlight filters through budded leaves, dapples a swath of lucky charms clover, and splashes along the undergrowth to beacon across one, solitary, morel genuflecting toward the ground. The morel is toadskin dry but I don’t care. I whoop with delight. Over the next hour my dad and I find a little less than a half-pound of morels—or at least I do. At a future date my father will brag about my ability to see morels, and a year from now he’ll do me proud finding them on his own, for now, though, we have a handful of pale colored morels—enough for a shared dinner. We check the barn before we leave, find nothing, and delight instead in the mere knowledge that we’ve not been skunked. 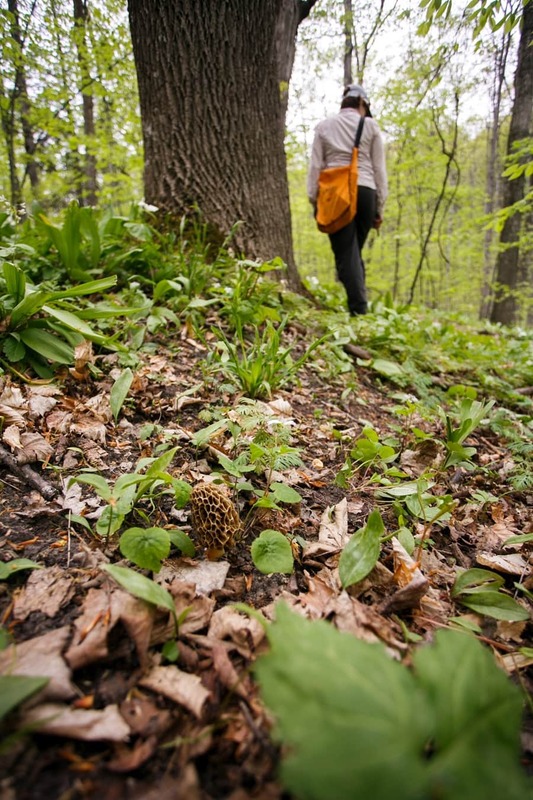 Having worked my way home through the forests of southern Michigan to get here, and finding nothing but a couple of verpa conica—which often fruit slightly before morels—and a handful of leeks along the way, I’d been scared of finding nothing at all. Come evening, we roll our little find in flour and fry them in butter, too pleased with ourselves by half. Later in the week, I’ll return and crawl the orchard on hands and knees, finding more have grown in the time that’s passed. That was a year ago, but the yearning for morels sings me home again the next spring. One day, we move slowly through a cemetery, a vagary of trees leaning toward one another overhead, grass crunching dryly beneath our feet. It is not entirely clear to me if we’re there to find morels or visit ancestors. We stroll past his mother’s grave, a woman I met but never knew, and say a word or two of hello, and ask her to push up some mushrooms. I wonder if she would be pleased to know that her aprons hang in my kitchen closet; that if we were in my home not his, I’d don one to flour and fry the morels we find and serve them to her only son. Dad can name just about everyone in the cemetery, but it’s the other stories—about his childhood, his life before us, the grandparents I never really knew—that I collect instead of mushrooms. There are no morels in the graveyard. We gather ghosts and histories instead. Next, we work a hillside where Dad found one decades ago but today find nothing. We stroll through the yard of my aunt, where morels flourished come spring for years, and find it barren. We stop at the site of my first ever morel, the one my father still tells stories about. Our memories of where it grew are different: In my mind’s eye it looms along the road’s right shoulder, above the sandy edge of the tiny crinkling creek I tromped past every day on my way home from school. To him, it had sprouted on the freshly paved road’s left edge. When I contradict him on this he mocks consternation. Surely it was on the left side of the road, he says, as I’d have been walking home from school, against traffic. He’s probably right, I was a good kid. Either way, its appearance then was likely an anomaly: Morels seem to have a predilection for disturbed earth, and once things return to stasis these fungi retreat again. We find none along the blacktop road, long since faded. Together, we return to Marce’s orchard, and together we come up empty. It is not that I cannot spot a morel. If a morel is present I will find it. You screw your eyes up a bit, daydream beyond the logs and leaf litter, enter the reverie of the morel. It’s the art of looking; the art of not looking; the art of scanning the horizon, setting the mind free. This is how to see them. Still, everyone else seems to be finding morels but us. At Mother’s Day brunch, 83-year-old Marilyn Skold tells us she’s headed to Empire to forage with her grandchildren. At Stormcloud Brewing in Frankfort, a friend regales me with the mushrooms he’s just found; on Facebook, golfers seem to be caddying morels. 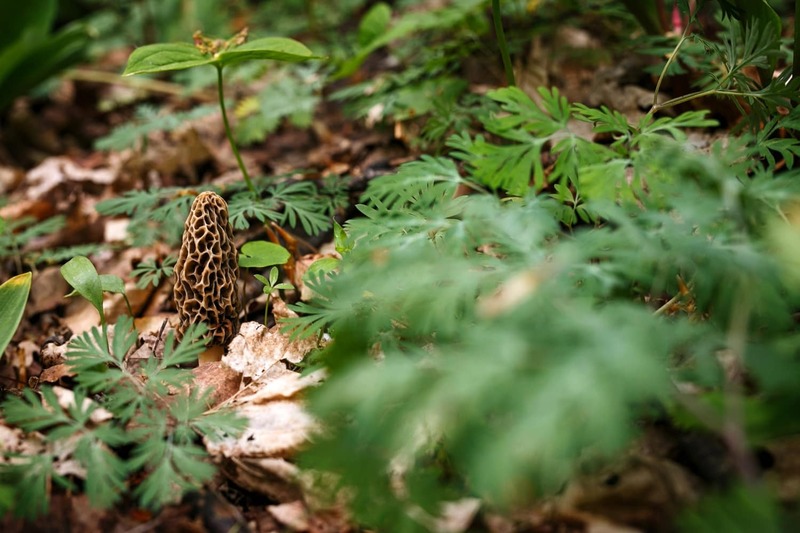 Gathered around a campfire with a handful of Interlochen faculty and staff on a cool evening, the conversation turns to morels as naturally as breathing. There’s Lesley and Tony, who didn’t even like mushrooms before they found their first patch of morels days prior; Chad who broods at the fire, then admits his patch hasn’t started producing yet, then smirks and mentions he found a new flush while walking the dog. “Where?” I query. Not where because I want to hunt them, but where because suddenly I cannot seem to find them anywhere, despite what has long seemed a sixth sense. In hardwoods, while walking the dog is all Chad will venture. 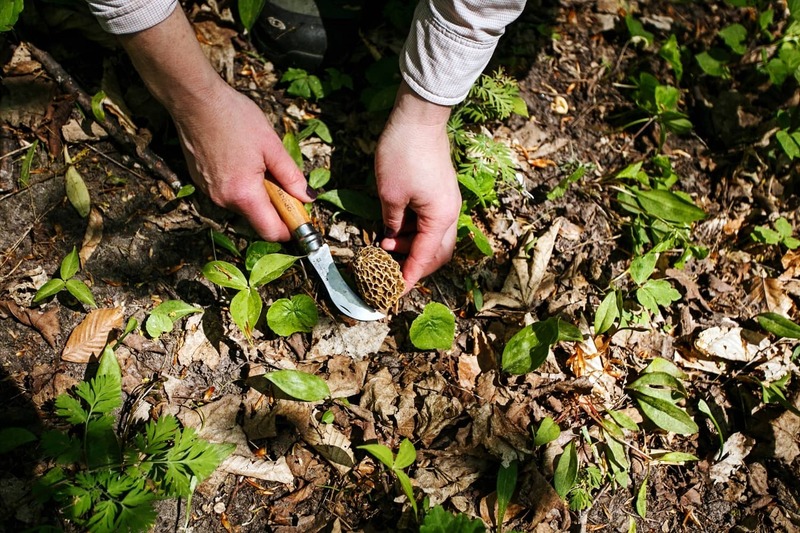 Another friend, Tim, shares his method—a morel growing technique—by which he swears he has doubled his crop every year. Last year it produced 15 morels; this year it’s 30. My mouth waters to think of them. It’s a dry afternoon and I’m deep in a woods, walking around in circles unsuccessfully when Mom texts me. A friend’s husband has been having luck, and would I like to join them? It is a rare gift for someone to share their site, their cache. There are stories in the South of mushroom spots being handed down in wills. 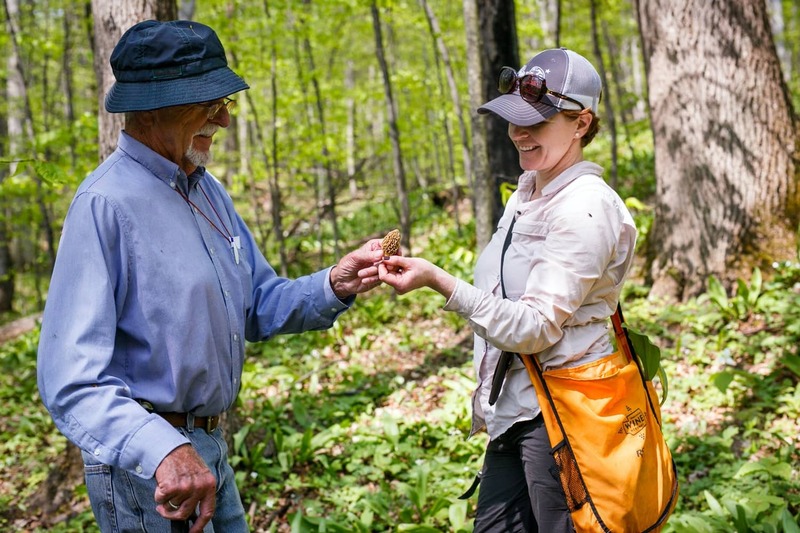 Tim Keilty, of Leelanau Natural Beef in Cedar, has two sites near his house, and when he finds someone who has slipped the fence and is cutting his mushrooms he gives them a choice: pay his property taxes or hand over his mushrooms. They always hand over the mushrooms. 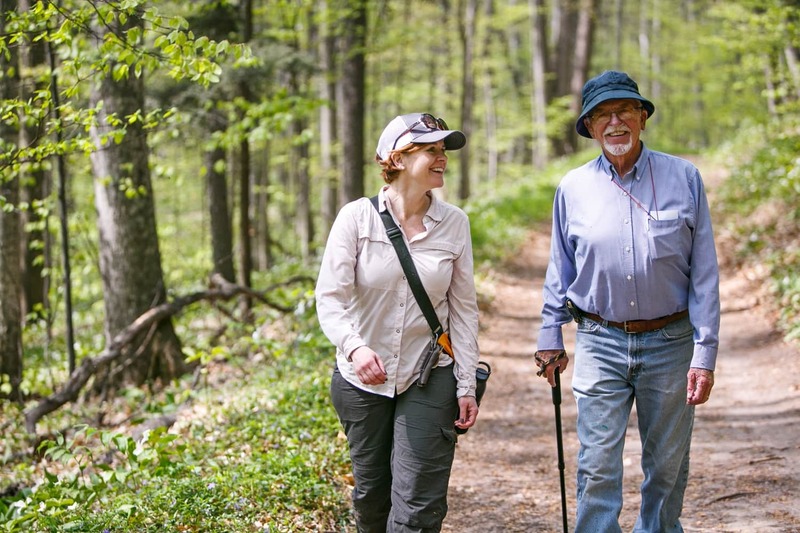 The rest of us, those without homes surrounded by copses of ash, the rights to farms from generations past, or little riverside acres to call our own, are left to forage state parks, national lakeshores, and even golf courses. While any public space may be fair game, no one is going to share their sacred site, and finding cut stems and realizing someone else has discovered your mushroom mecca makes for a sad day. So, for Eldon Miller, former men’s head basketball coach for Western Michigan, Ohio State, and Northern Iowa—and the 1983 Big Ten Coach of the Year—and his wife, Dee, to let us tagalong is a gift. As it turns out, Miller is here to give me an education not in morels but in trees. 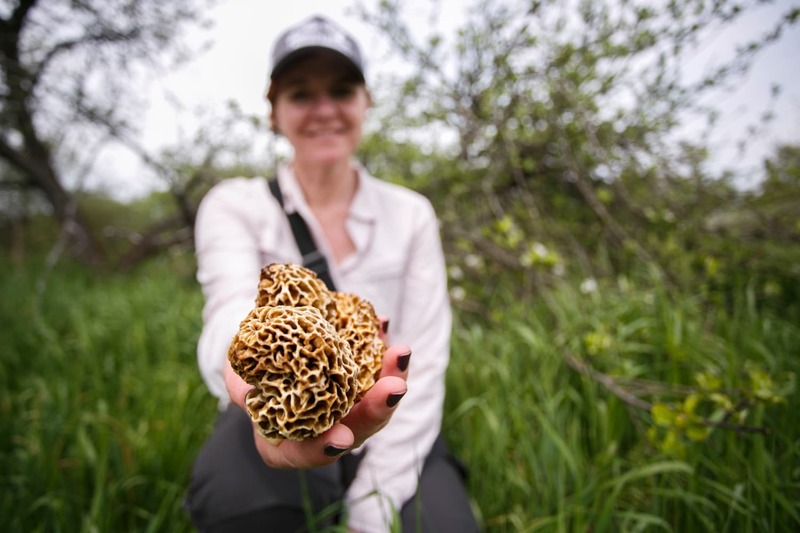 If morels love the charred remains of pine forests in Washington, dying and dead elm trees throughout the East, they also love the white ash in Michigan. Especially when those ash trees are old and dying. As emerald ash borer spreads and takes these old trees with it, will morels disappear as well? Miller schools us in ash, identifiable by their gray, diamond-groove bark and opposing leaf structure. More importantly, he shows us how to recognize the older trees, those just beginning to peel their bark. Beneath these, morels seem to flourish. The four of us work up a valley and climb the hills. Ash tower overhead, leaning left and right, creaking from time to time. Our feet crunch the forest floor and we are magnetized by those trees that are just beginning to disrobe their bark. I scan the horizon, my mind untethered, unpracticed, a loose jumble of daydreams and quests, mapping shapes without effort. This is, this has always been, how I see morels best. Not by staring them down, but by letting them materialize in my peripheral vision. I look across the forest floor, to where the valley bends brown waist toward breast of hill and see the first along my periphery, almost out of view. A morel rises conically against the chiseled gray bark of ash. Farther on, another morel juts, barely visible, lightly yellow against leafy litter. Miller points out some thimble-sized mushrooms among the fallen leaves. These we leave, hoping they will grow larger. 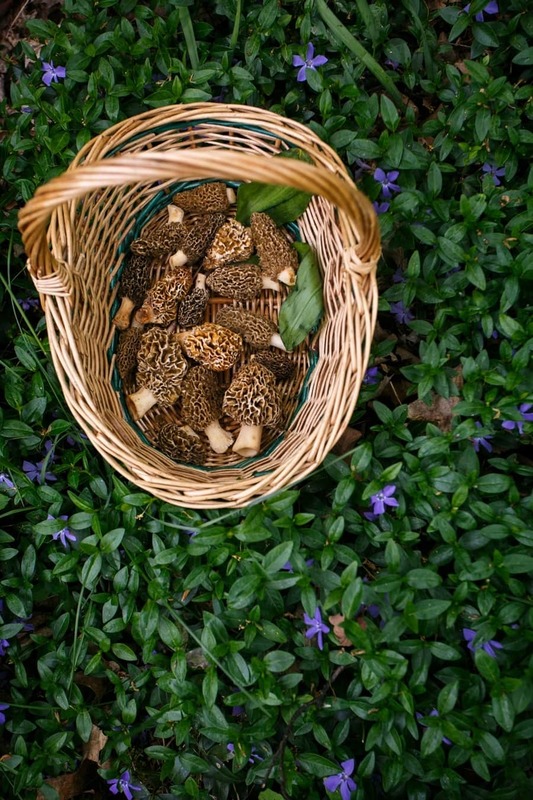 A few hours later we depart the woods, half a pound of morels between us—and my faith restored. Two days later, my father and I crawl into an ash-filled forest near Lake Michigan on our own. We cut off a well-worn trail, and he forages the eastern valleys as I work the hills farther west. High atop a ridge, in between the upturned roots of a tree, I find some gyromitra gigas—more commonly known as a snow mushroom, a snowbank false morel, a bull nose or a walnut mushroom by some. Wrinkled and convoluted and big as my fist, its stalk is massive, its shape is almost cubical, its structure is dense and brainlike. I cut the mushrooms and slip them into my bag. At least we’ll have these, at least it’s something. Just as I’m thinking that this might be our only find of the day my phone buzzes and a morel appears on the screen. Dad is on them. He marks his spot and we convene on the trail, then dip in to forage the area together. That first conical prize rises at the base of an ash and, as we stoop to cut it, more appear. From the corner of the eye we spot a spade of blondness, then a dark gray morel materializes feet away to our right. Don’t move, one of us says to the other who is poised to crush a large morel underfoot. Morels pop among the forest litter like gnomes. We spend an hour together searching the underbrush, cutting mushrooms, and chattering happily and imagining dinner. My faith in our abilities is restored. Later in the afternoon, I return to Marce’s orchard. I do not tell him I am there but wave instead toward where I imagine he is perched, casting his gaze out the window. I slide into the orchard without expectations—we’d been here days earlier without success, after all. Still, hope springs eternal in this forager’s heart. Everywhere the grass is longer than last year, the branches dip closer to the ground, which is now parched. It’s a delight and surprise then when I find a large white morel, crispy dry and curled over on itself, beneath a thirsty apple tree. I cut it anyway. Soak it in water and it will not be pristine, perhaps, but it will revive enough. I work the orchards, finding morels we’d missed days ago, or which somehow sprouted suddenly and instantly dried up. I take what I am given and celebrate each find. Come evening there are a few fingers of bourbon and a plate of mushrooms between us. And, there are goodbyes. Come morning I head east. It will be another year before we’re in the woods together again. Dawn. The pavement casts its silver thread to the southeast before me. Cruising out of Mesick the wheel seems to strain in my hand, an imaginary force pulling me toward the Manistee National Forest. I tap the gas, fight the urge to pull over, to dive headlong into the bramble and woods. I drive on. The morels are there, I know. This patch, I promise myself, I’ll return for next year. The bottom rim of the morel cap is attached to the stalk. Beware the lookalike verpa—it makes some people sick. Its cap attaches only at the apex of the stalk and is loose around the bottom rim. Books like Mushroom’s Demystified, by David Aurora, and The National Audubon Society’s Field Guide to Mushrooms are good guides. When you first spot a morel, stop and wait. Squat down, scan the vicinity. Be Buddha. Be Buddha of the forest. Sometimes it’s less about seeking and more about stumbling upon them. In Michigan, first look for ash trees. But know that morels like a wide variety of habitats and trees, like elms, other hardwoods, old apple trees. Keep an eye on trees that are slipping their bark. It’s not unusual to find morels nearby. Morels are easier to spot when looking uphill. When Julie H. Case isn’t writing about travel, wine, or weird science, she can be found deep in America’s forests, foraging for mushrooms, which she blogs about at soIgather.com. // Melisa McKolay is an award-winning photographer specializing in lifestyle portraiture & wedding photojournalism. More Morel Tips + Morel Recipes!